Planning a kitchen remodel? Learn how to design a kitchen with these kitchen renovation tips and ideas! 14 years of marriage. 4 kids. 7, 894 baseball games (ok, maybe that’s a bit of an exaggeration, I admit 😉 ). And – no joke – 4 full kitchen renovations. 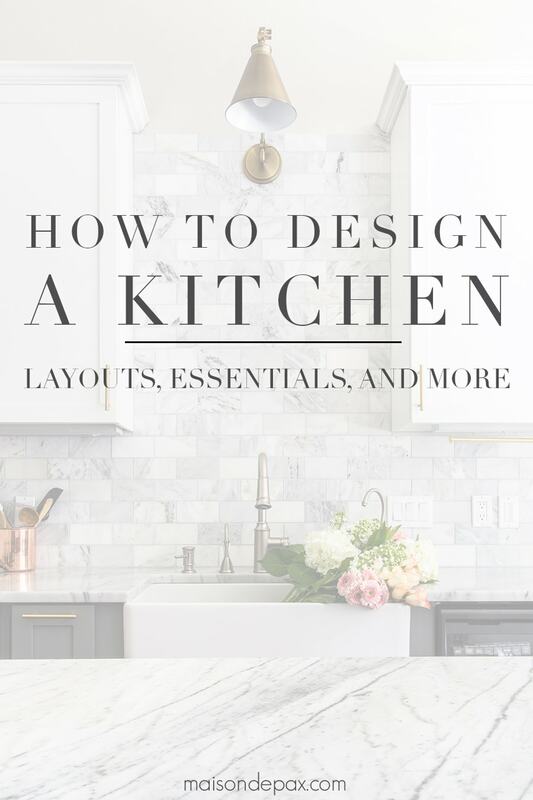 I may not be an official expert, but I’m getting the hang of this kitchen planning thing… and I’m so excited to share with you my top tips for how to design a kitchen. 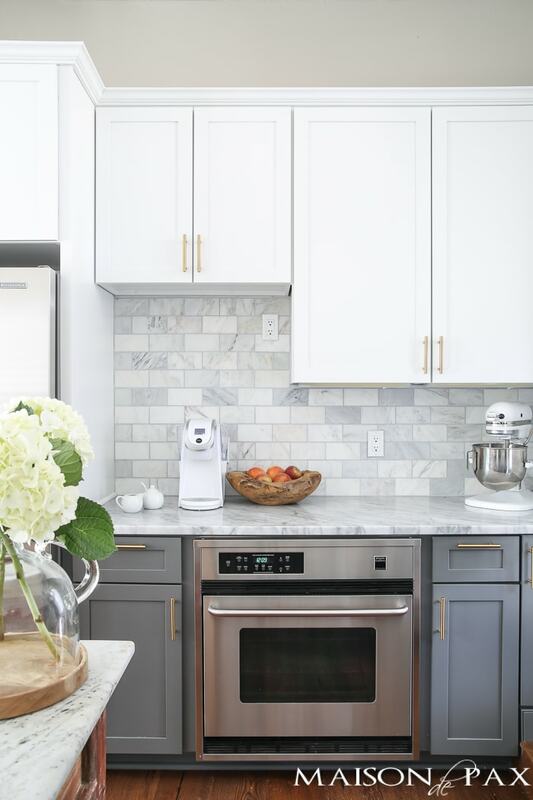 While there are all sorts of amazing innovations and organizational bells and whistles out there (and don’t worry, I’ll be showing you more of those with our current kitchen project soon! ), I thought today might be a good time to start with a rundown of my basic kitchen renovation planning process. 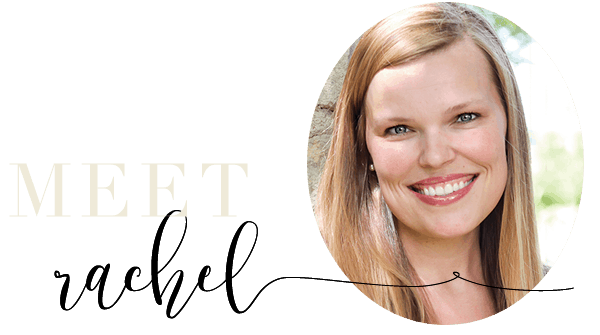 So often I get questions from readers about how to even begin: how to figure out what they need, layouts, styles, and more. And while that’s enough material for a book, I want to start with something simple today: the top 10 things you need in your kitchen. 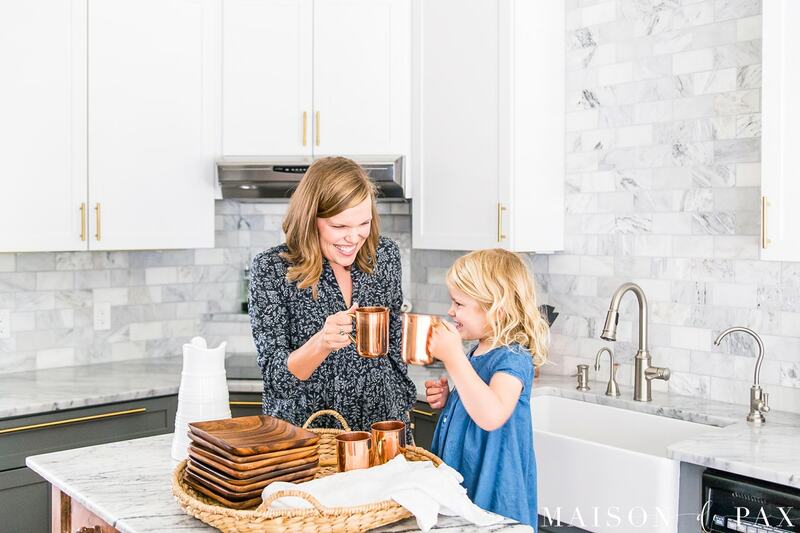 Whether your kitchen is gargantuan or teensy (and we’ve lived in an itsy bitsy European apartment as well as a sprawling Texas ranch home, so we’ve seen it all! ), these are the things that just about anyone must find space for. You might have 5-6 drawers for each one or simply a corner of one shelf, but you’ll need a spot for it nonetheless. 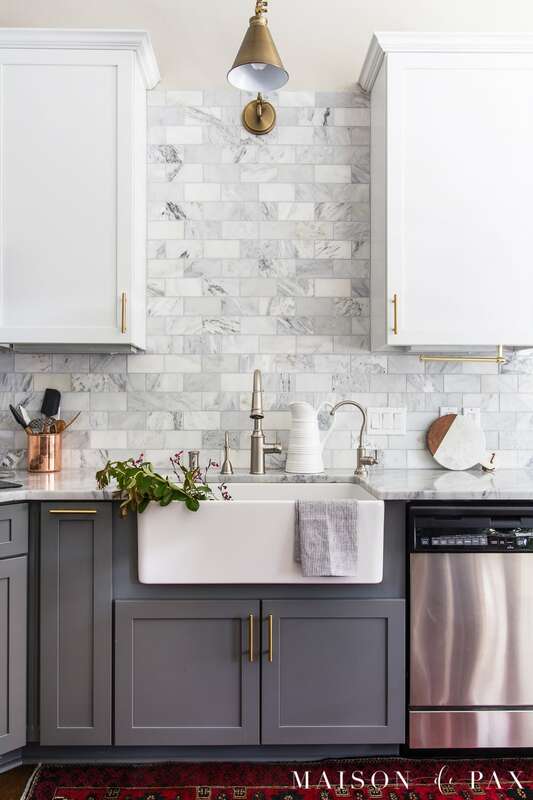 When I begin to plan my kitchen renovations, I always start with these things (and pretty much in this order of importance) to make sure I can integrate them all into my design. This is probably the defining feature of a kitchen: you have to be able to cook something. And unless you’re a master at girl-scout fire building, you’ll need some appliances to do so. I always start by asking where my fridge, stove/range, and microwave will fit. Often, you may not have options regarding these things, so place them first. The second most identifiable element to a kitchen is your sink, and it needs a spot! I love to place a sink under a window, if possible, but a central island location or a feature wall can be good options, too. And if you’re planning on a dishwasher, be sure it’s beside the sink for ease of loading. Kitchens produce trash. It ain’t glamorous, but it’s a fact. Even if your chosen solution is to have a trash can in the corner of the room or on the floor of the pantry, you’ve got to have a place to put it. Even better, you could try integrating it into your cabinet design with a variety of pretty, organized options. 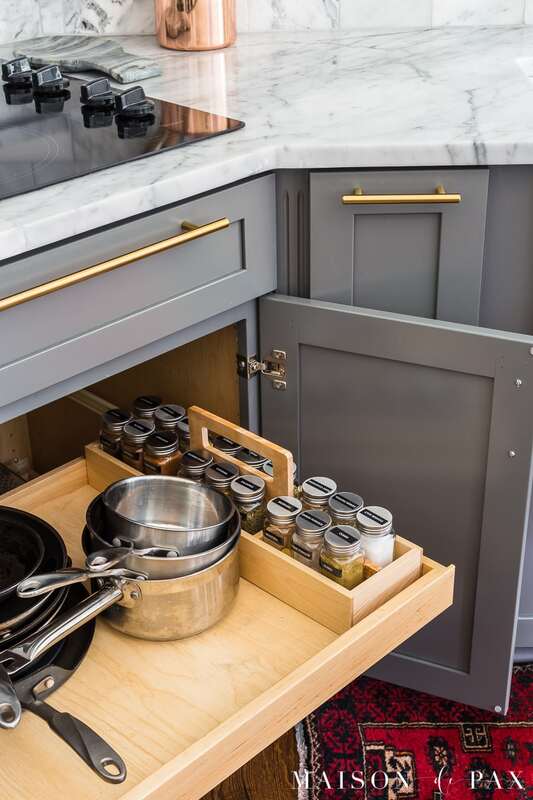 Whether it’s a single pot to boil the water for mac ‘n cheese or a full chef’s set, you’ll need shelves or drawers to house them. 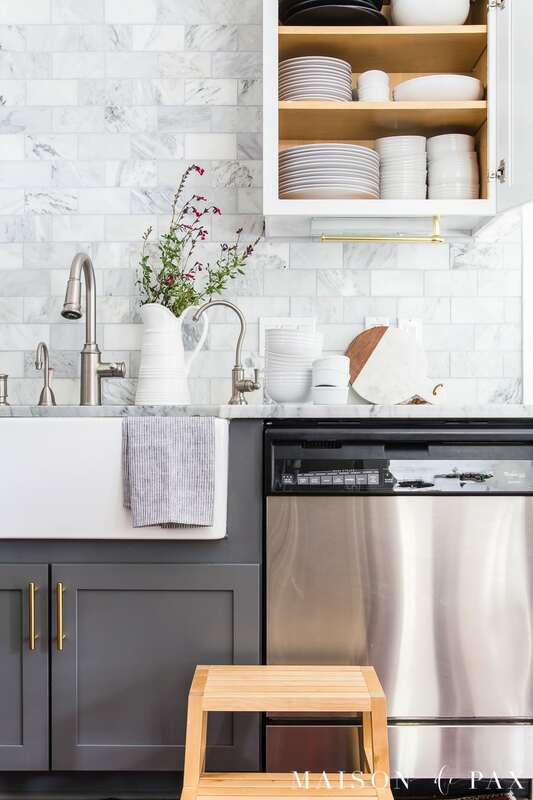 Not only do you need to consider your dishes, but since they are likely used daily, you’ll want to consider placement: ease of reach as well as proximity to your dishwasher. And if you’ve got kiddos, you’ll want to consider storing breakable ones safely out of reach and kid-friendly ones accessible for little helpers. You’ll need some for cooking and eating, so don’t forget to consider both. It’s possible if drawer space is truly limited to keep one or the other in an organizer on the counter, but I always try to keep my counters clear if possible (a place for everything and everything in its place! 😉 ). One thing I’m excited to use in this new kitchen: a tiered cutlery organizer… it’s like doubling the size of your drawer! These little bottles need some organizational guidance for sure. You can see how I’ve organized mine in my current kitchen here. More importantly, they need a spot near your cooking station so you don’t have to gather and carry them all the way across the kitchen. Even if that spot is simply an organizing caddy on a shelf, you’ll want them corralled and accessible. These guys are the ultimate square peg, round hole of kitchens. 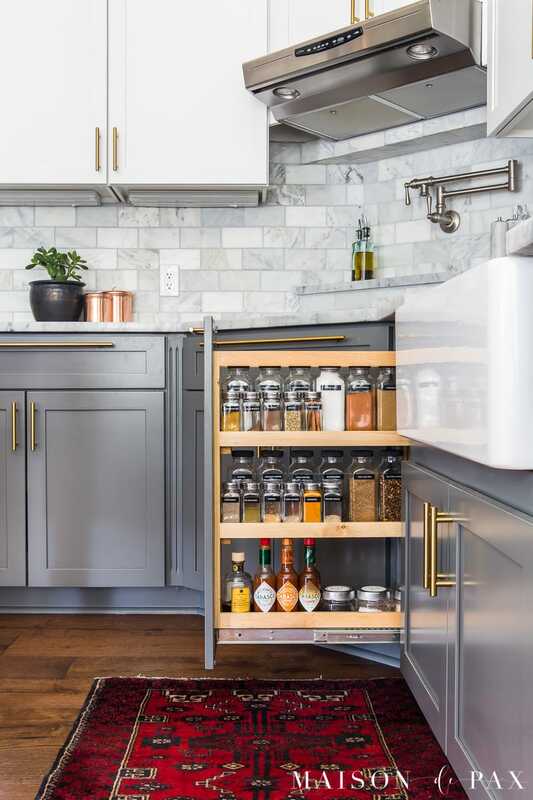 Trying to store them in your typical drawer or cabinet can be so frustrating, but with a well-planned cabinet with vertical dividers, they can be easy to access and simple to keep organized. I’m a big fan of keeping things simple, honestly, and I don’t use too many small appliances… but to each their own! Even I still have a coffee maker, mixer, toaster, microwave, and egg cooker. Whew, that feels like a lot! 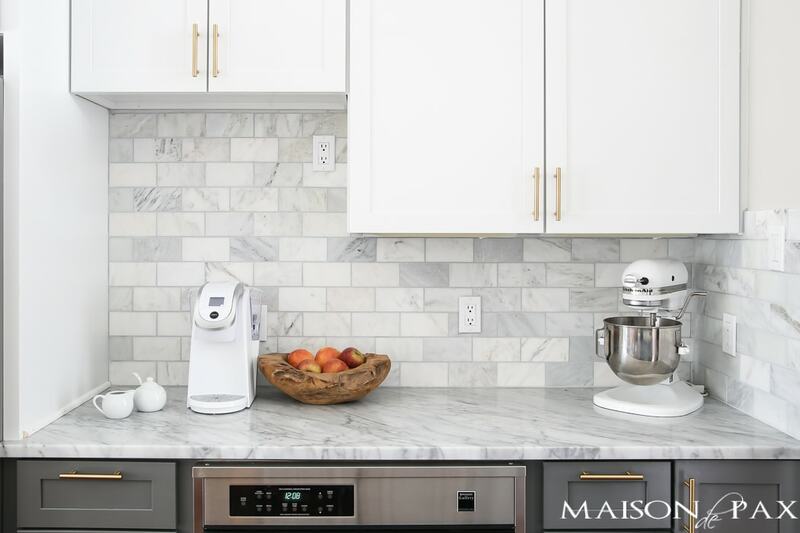 Whatever your number of small appliances, be sure to consider where they will live in your new kitchen. Also consider if any of them could be stored in less accessible places (back of the pantry or in the utility room, for example) if they aren’t used very often. As I said, when I begin planning a kitchen, I start with these 10 things. 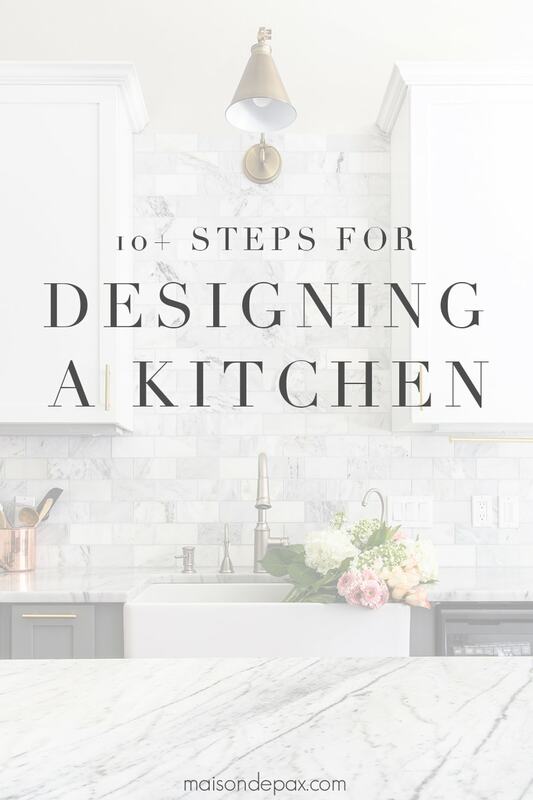 There are other considerations, of course, but whatever your size, shape, space, etc., I have found that every kitchen needs those 10 things, so I hope it helps to start there! For this upcoming project, we are working hard to keep our triangle to a single side of the giant island, while still utilizing the other side for useful storage of the less-frequently used items. For this most recent kitchen renovation, I am dreaming up all the best options… and I can’t wait to show you. Hint: we’re removing two walls of a U-shaped kitchen and transforming it into a galley kitchen. No kitchen planning post is complete without my mentioning that every family is different and has different needs! I love a kitchen that works specifically for the people using it… So take these 10 essentials for a kitchen design as a starting point. 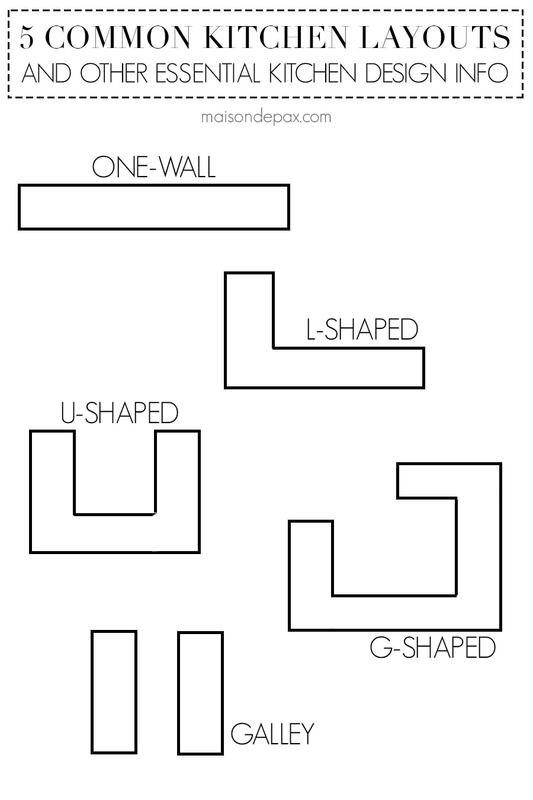 Consider your layout and triangle. And then ask yourself what you need for your home: a command center? A broom closet? A section for dog food storage? Work to make the space work for you! And after all those decisions… you get to the really fun stuff: cabinets, countertops, hardware, lighting, and more. Check out these related posts for more kitchen planning and kitchen renovation help! Thank you for sharing such an useful post. G-sharpe really gives cozy feeling. Susan, thanks so much for sharing that! 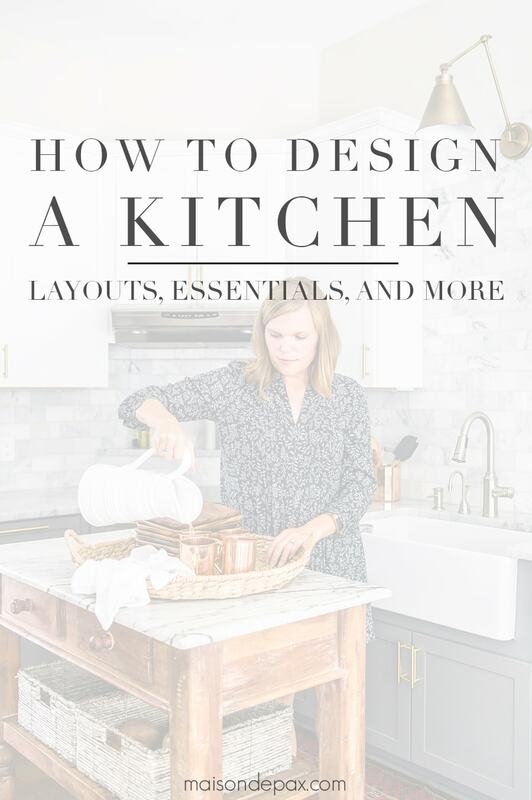 I really wanted it to be a helpful start for those wanting to re-design their kitchen! What’s wiiith that sink!! Frankly I fell in love with it and I couldn’t get my eyes of it, in order to read the rest of the article! Really, really, really love it! i love your style! this is beautiful and such a great resource for an otherwise overwhelming process. kitchen reno is on our top 5 list of “one day” home improvements. i pinned this so i can come back to it later. thanks for taking time to share your expertise! Erin, I’m so glad it was inspiring! Kitchen renovations are big projects so it’s smart that you are planning ahead! Thanks for pinning too! I thought it was interesting how you said that you love to place a sink under a window or on a central island location. My wife has been wanting us to remodel our kitchen so that we can have newer appliances and smoother looking tables, so we have been looking for a contractor to hire. It would be great to have the advice and wisdom of a professional while we plan out this renovation. Thanks Dean! I’ve thought about writing a post like this before, but my biggest suggestion is asking your friends in your area. There’s nothing quite like a personal recommendation! I want to remodel my kitchen this summer. So, I liked that you explained that you should think about the features you want in your cabinets. I liked that you explained that you should think about if you want things like trash cans in your cabinets. That would be a nice way of keeping my kitchen clutter free. Glad it was helpful for your kitchen inspiration, Penelope! I like the idea of putting your sink under the window. This will definitely add an outdoorsy effect when you wash your dishes while staring outside of your window. I’m gonna renovate my kitchen next month, and your article gave me a lot of ideas on how to amazingly revamp my kitchen. Thanks. So glad it was helpful, Bree!